Who hasn't shot at a soda can with a BB or pellet rifle or pistol? 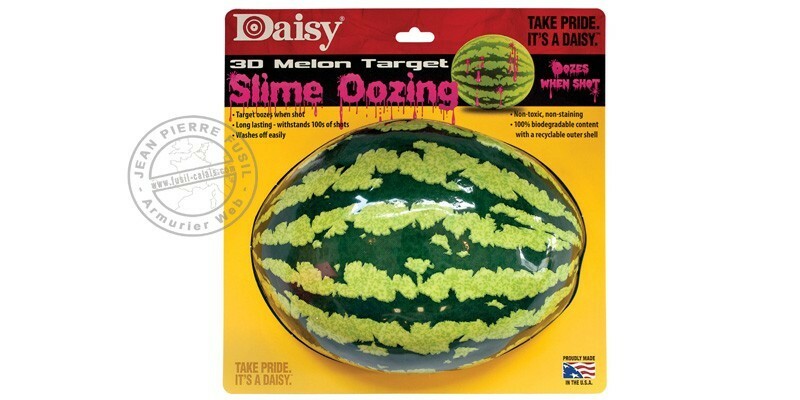 Now Daisy takes an old tradition to the next level with our new Oozing 3-D Targets. 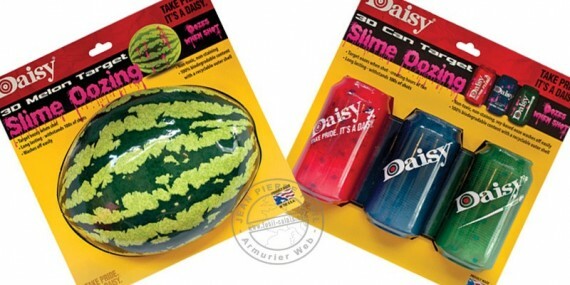 The american brand Daisy has created 2 targets : half a watermelon or cans, regarding the purest tradition of plinking : target oozes when shot a red slime, imitating the fruit juice or soda! Half watermalon or 3-cans for fun shooting. Very realistic, they are composed with foam soaked with liquid, biodegradable, in an outer shell recyclable. When shot, the pellet pierces the outer shell, and free some of the slime, that will ooze out of the target. The visual effect gives impression that the fruit has exploded and loses juice, or that the cans are pierced ans let the soda flow. Non toxic, the soy-based ooze washes off easily. For .177 shooting, this target withsands 100s of shots. For an optimum using, do not detach or cut the target from card, and hang it on a proper backstop.